Many thanks for posting this entry on the eve of 12th January and also information about Shashwat Bharat tableau! Let the Calendar Birthday of the Eternal Hero of youth inspire more and more of these children into His fold and raise them from where they are! 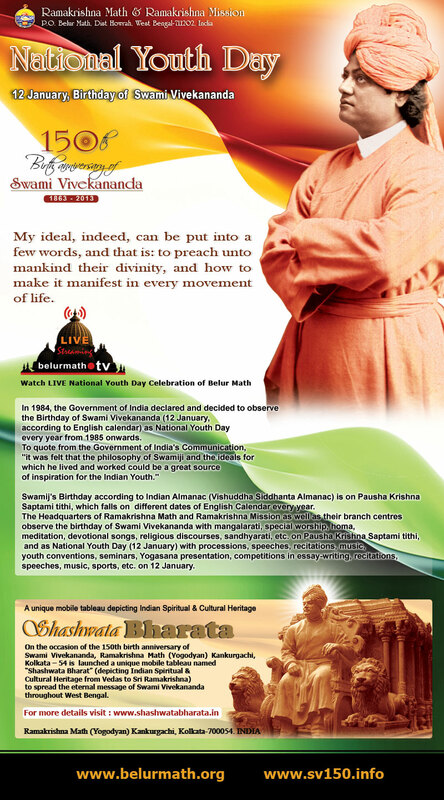 Gracias siempre por sus publicaciones, nos mantienen despiertos y unidos a los que amamos a Swami Vivekananda,. Deseo que este año se haga oir especialmente , Vedanta , a través de este león que atravesó los mares y llegó a Occidente con el mensaje de libertad , es mi sincero homenaje intentar divulgarlo en América.. Saludos Maharaj y bendiciones! Thank you always for your posts, keep us awake and together we give our love to Swami Vivekananda. I hope this year we will do hear especially Vedanta, through this lion that crossed the seas and came to the West with the message of freedom. it is my sincere homage to divulge American tribute .. Maharaj Greetings and blessings!